Our basketball baby bedding is the perfect shot for a comfortable kids room. Share this sport with your little baby by decorating their nursery with fun basketball baby designs. Bright colorful designs and fun pictures will have your baby jumping for the ball in no time. Whether you're supporting a favorite team or just the love of the game, basketball-themed home decor will help you to show off your style, and your baby's first bedroom. 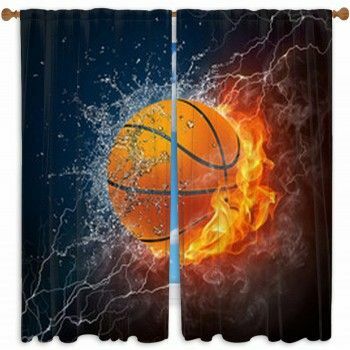 From silhouettes of dunking players on a baby blanket to flaming basketballs for a toddler duvet, our basketball designs will have your infant dribbling down the court... or crib! We even have illustrations of basketball playing penguins for a unique style as zany as the Globetrotters. But, if our vast array of designs isn't enough for you to get off the bench, then why not design your own custom baby bedding? With the ability to fully customize your baby's bedding, you'll be shooting and scoring both. Try a toddler comforter with a basketball court on it, and add your child's photograph layered over the court for a personally-tailored bedspread. Use one of our timeless photographs of a basketball hitting the net and alter the luminance so the orange of the ball pops right off the wall. Basketball baby bedding is a unique way to introduce your baby to the world. Their very own basketball bedding set will keep them entertained throughout the day and into the night.